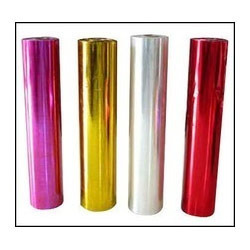 We provide quality approved range of Metallic Yarn Film to our valuable clients. We “Prizm Holography And Security Films Pvt. Ltd.” are a well-known Manufacturer and Supplier of a qualitative assortment of Holographic Products, Packaging Products, Textiles Packaging Products, Holographic Film, etc. Integrated in the year 2014, at Greater Noida (Uttar Pradesh, India), we have developed a well-functional infrastructural unit where we manufacture these products. Managed under the headship of, “Mr. V. Gupta” (Director), our organization has covered foremost share in this domain.